My kitchen counter, covered with this week's farmshare bountyWhat am I going to do with all of this stuff? It's taking over my kitchen! My fridge is still nearly full from last week's Harmony Valley vegetables! My fruit share includes an entire bag full of apricots! I've been eating salad greens and sautee mix non-stop for weeks! I don't know if I can eat another basil vinaigrette. And now that there are tomatoes - blessed, delicious tomatoes - it occurs to me that nobody else in my family will touch them. How on earth will I eat 10 tomatoes by myself this week, along with 3 weeks of potatoes, 3 cucumbers, a bunch of peppers, and a million other things? I still don't know what to do with red amaranth, for crying out loud! And did I mention that we're starting to get more food from our garden, with the help of A Backyard Farm? Awesome, but how many chives and jalapenos can a family of 4 eat each week? I'm up to my elbows in green beans. Up to my knees in squash. Up to my armpits in amaranth! Breathe. Slowly. Okay. I'm better now. If you've been reading this blog, you know how enthusiastic I am about this whole eat local experience, how I've jumped at the chance to join a CSA (my first post! ), grow a garden, take my family to Riverbend farm for onion planting. Heck, I even wrote a whole article about radishes! But I've got to be honest. 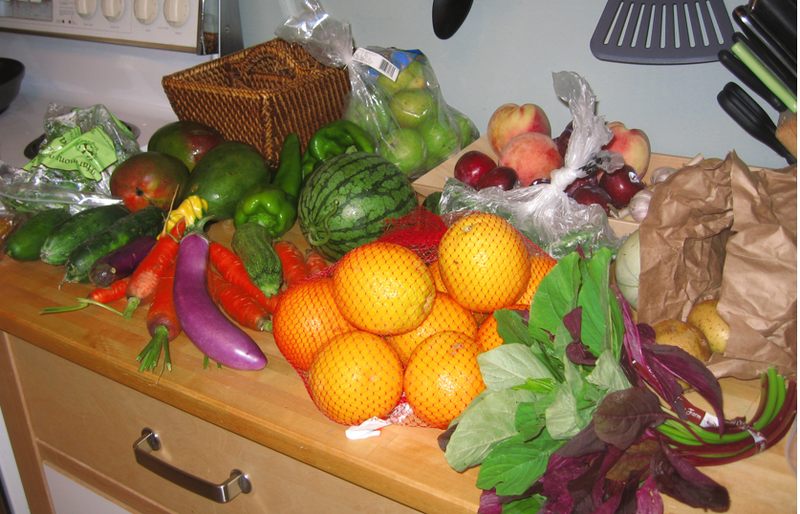 When I got all of today's produce home, I laid it on the counter (as in the picture above), and I sort of freaked out. What on earth are we doing?, I wondered. I took a deep breath and got to work. I sauteed my greens with Organic Valley butter and Harmony Valley garlic and onions. My wife grilled onions and tomatoes with the pork chops that were delivered by Carter from Simple Provisions during the day. We ate carrots and a bit of Lovetree Farm cheese as an appetizer. Dinner was satisfying and delicious, all locally grown. It turns out that eating local food - or any good food, for that matter - isn't always easy. But it's consistently delicious - and constantly rewarding. My freakout is over now. Everything's going to be okay. And tasty.